U.S. stocks rose for a second week, extending the rally resulting from Donald Trump's surprise election as investors speculate the president-elect’s developing policies will encourage faster-paced growth. The S&P 500 has added nearly 3% since Election Day, led by a surge in financial and industrial shares. Last week’s more subdued gains came about as Wall Street transitions from initial election euphoria to current market fundamentals. Excessive U.S. dollar strength had varying effects last week. For the week, the S&P 500 rose nearly 1% (+0.98%), the Dow Industrials extended gains by +0.51%, and MSCI EAFE fell -0.73%. 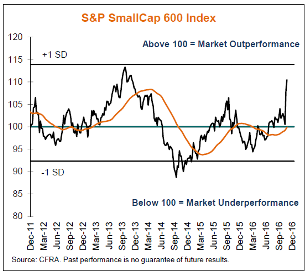 Chart of the Week: Can Small Cap Strength Last? The S&P SmallCap 600 soared 10.6% in the days between November 8th and 18th. It was the best performing benchmark return within the S&P Composite 1500, as the S&P MidCap 400 gained 6.1%, and the S&P 500 rose 2.0%. CFRA Research, the new parent of S&P Global Intelligence, believes these performances are based on two things: 1) the exiting of positions placed ahead of the then highly-expected Democratic victory, and 2) the speculation that on a macro level President-elect Trump’s policies will lead to higher U.S. GDP and EPS growth. The first question on many investors’ minds is “Will it last?” Will investors continue to favor small-cap stocks, due to their limited fallout from a strengthening dollar? Certainly, a shift in sentiment has occurred, which could carry on to the end of the year. However, CFRA Chief Investment Strategist Sam Stovall believes that in many cases, such moves have been too far, too fast.